With client comfort being a common concern that every laser hair removal technician hears at Dermal Laser, it is nice to be able to provide some peace of mind to our valued clients, especially our new clients who haven’t yet experienced a treatment and may have lingering concerns about their comfort level. Today on House of Beauty we are excited to share with you the Vectus. Ladies, in your lifetime, you will spend a total of 2 months shaving. Men, your number for that clean shaven look is 6 months! With that in mind, lets shave some time off and reduce your body maintenance with some laser hair removal! The Vectus Laser has the largest spot size on the market speeding up your treatments and cutting back on your time in office making lunch hour treatments a reality for the New Year that is just around the corner. At Dermal Laser, we love the latest tried, tested and true technology and the Vectus doesn’t disappoint our technicians in any department. With its Sapphire tip that houses state of the art cooling maintaining a temperature of 5 degrees celcius to keep your skin cool with every contact the Vectus makes your treatments safer and more comfortable. 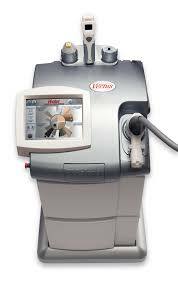 If that wasn’t enough, the Vectus comes with advanced technology that measures the skins melanin. Skintel is used by technicians to determine the settings for each client that we see. Allowing our technicians to be made aware of the need to postpone treatments due to sun exposure or the use of self tanning products as well as treat your skin at its optimum settings for the best results. Laser Hair Removal 101 (or a refresher for those of you who visit us here at House of Beauty regularly) reminds us that the darker and thicker the hair, the better your results will be. Throughout your series of laser hair removal treatments, shaving is the only other method of hair removal that you can use. Your technician will give you time lines in regards to when you can start treatments if waxing, threading and/or tweezing have been your removal methods of choice, typically 4-6 weeks is needed between stopping those methods and commencing a series of laser treatments. The hair you have and how you have maintained it are necessary to review for your best results. Dermal Laser has been the winner of the Consumers’ Choice Awards for Business Excellence in the laser hair removal category for 7 consecutive years providing safe treatments to our loyal clients. Because of this, the safety of your skin, and the last laser hair removal refresher tip is an important one. Sun exposure. You can’t have any for a minimum of 4 weeks prior to commencing treatments. Sun exposure is not limited to a flight to Mexico with our often grey Vancouver winters. Tanning beds and self tanning products all fall into a laser hair removal no go zone. They remain a laser no no prior to your first treatment and for the duration of your series of treatments that will be spaced 6-8 weeks apart.